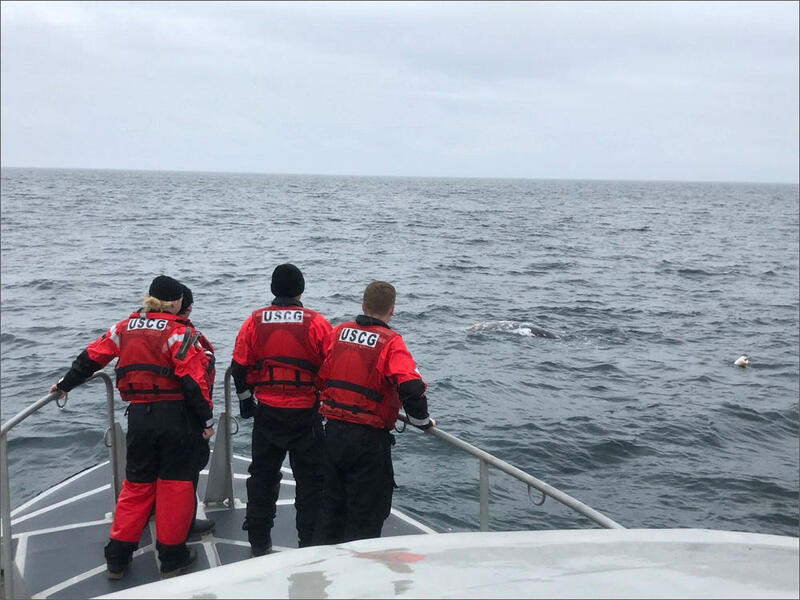 Crewmembers from Coast Guard Station Quillayute River standby to assist rescuers who eventually succeeded in freeing this entangled juvenile gray whale off the Washington coast. A male gray whale entangled in line from a crab trap stranded on the Long Beach Peninsula in southern Washington in April. 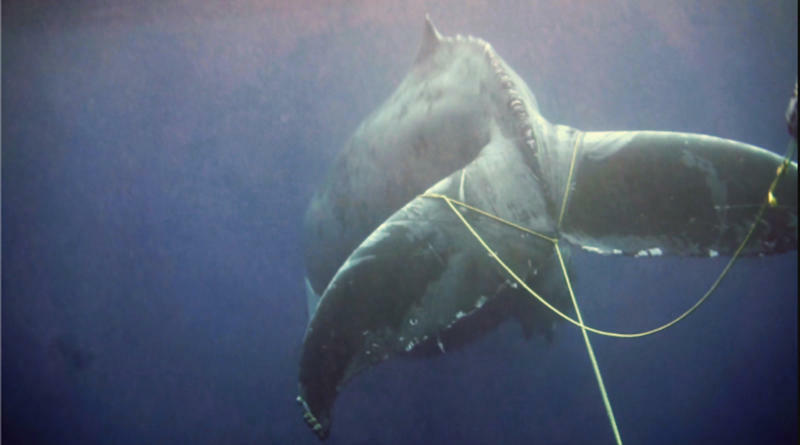 Specially trained rescuers have managed to free a whale that was tangled in fishing gear off the Washington coast. But they say the prognosis for the young gray whale is "guarded." A fishing boat first reported the severely entangled whale more than 15 miles off of La Push, Washington, on Tuesday. The Coast Guard and two teams of trained responders located the injured and struggling gray whale and spent parts of the next two days maneuvering to cut as many of the crab pot lines as they could. NOAA Fisheries spokesman Michael Milstein said the rescuers have now demobilized in the face of bad weather. "There are some lines that remained on the whale, but at least some of those we think may be able to work themselves free over time,” he said. Milstein said it is unknown if the freed whale will survive. "It's just difficult to tell given how compromised it was, and how much effort it had to put in to just staying alive, how well it will be able to do from here,” Millstein said. “But we have the best hopes for it." There have been four whale entanglements in Washington waters in the last month. That’s a number usually seen over the course of a whole year. Milstein said he's not sure why the uptick. 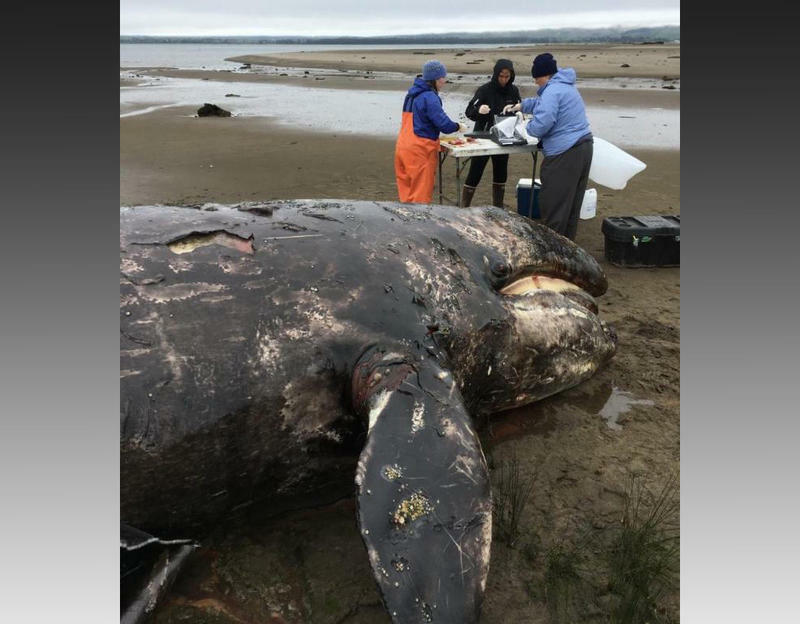 The first whale involved in the recent spate of entanglements stranded and died at Leadbetter Point, Washington. Another distressed gray whale spotted in Puget Sound in April was successfully cut free by responders. 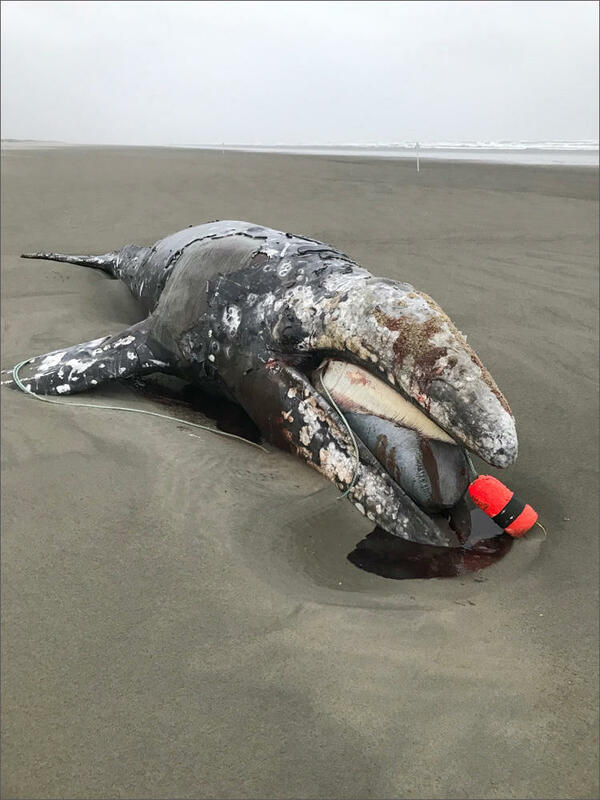 Milstein said crews from the nonprofits Cascadia Research Collective and SR3, which specialize in open ocean whale operations, placed a tracker on the entangled juvenile whale at the beginning of this week's rescue operation. The tracker was removed when the rescuers left the scene late Wednesday. 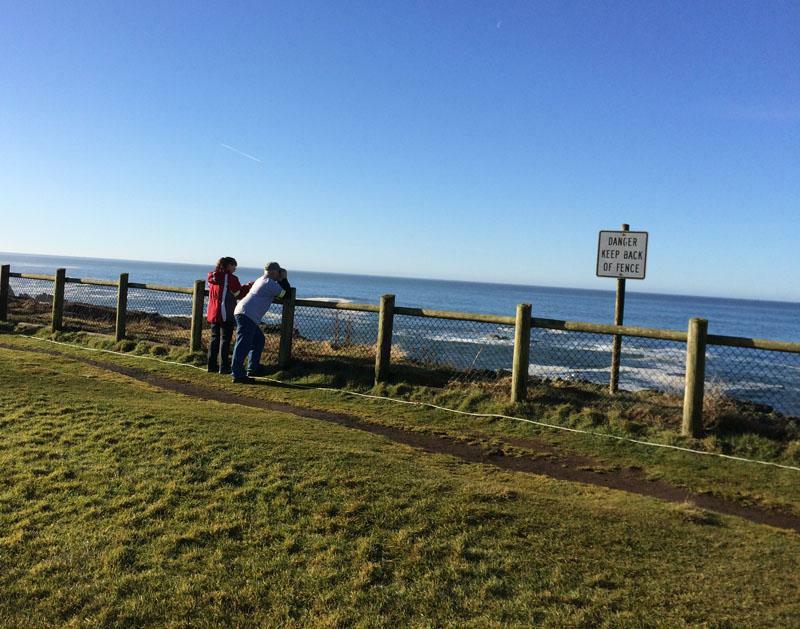 Milstein said NOAA has not received any reports of entanglements of grey whales off the Oregon coast during this spring's northbound migration of Eastern Gray Whales. The California, Oregon and Washington crab fishing fleets have formed separate whale entanglement working groups with support from NOAA grants. The Washington work group gathers next in Montesano in early June to craft voluntary "best practices" guidelines meant to reduce the risk of catching whales in the vertical lines that stretch between crab pots on the seafloor and marker buoys at the surface. Earlier this year, a gray whale calf died after getting tangled in crab pot lines near Seaview, Washington. Now commercial and tribal crab fishermen from the Washington coast have agreed to form a working group to discuss how to reduce the risk of a repeat. More than 30 times this year, the federal government has received reports of whales tangled in fishing gear along the West Coast. Sometimes the whales manage to wriggle free. Other times they don't, and you see heart-rending pictures on the news or a rescue mission. The week between Christmas and New Year's is one of the best times of the year to watch grey whales migrating along the Oregon coast.